Russian chemist; born at Odessa 1853; educated in the Richelieu Gymnasium of Odessa, and graduated from the Medico-Surgical Academy of St. Petersburg. In 1877 he went abroad and obtained the degree of doctor of philosophy. On his return he became assistant in chemistry in the St. Petersburg medical academy. In 1880 Goldstein passed the examination for master of chemistry, and in 1890 obtained his degree, his dissertation being on the rise of salt-solutions in capillary tubes, "Materialy K Voprosu o Vysotakh," etc. In 1891 he became privat-docent in theoretical and physical chemistry at the University of St. Petersburg, but in 1901 was compelled, by circumstances of a political nature, to discontinue his lectures. 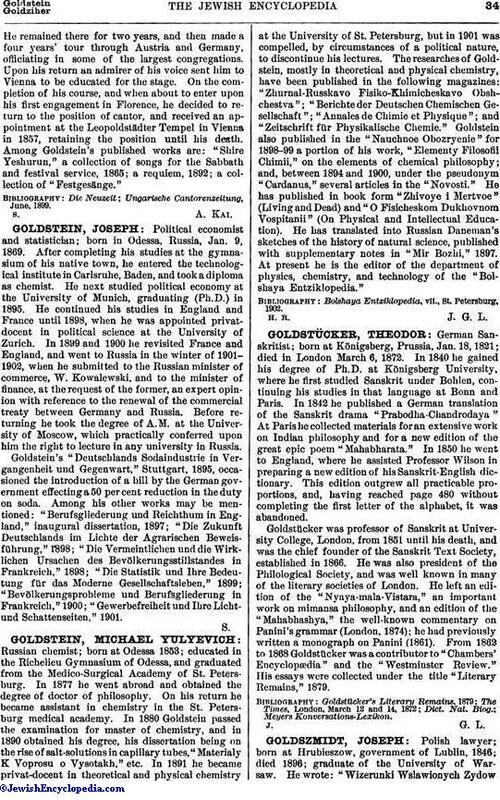 The researches of Goldstein, mostly in theoretical and physical chemistry, have been published in the following magazines: "Zhurnal-Russkavo Fisiko-Khimicheskavo Obshchestva"; "Berichte der Deutschen Chemischen Gesellschaft"; "Annales de Chimie et Physique"; and "Zeitschrift für Physikalische Chemie." Goldstein also published in the "Nauchnoe Obozryenie" for 1898-99 a portion of his work," Elementy Filosofii Chimii," on the elements of chemical philosophy; and, between 1894 and 1900, under the pseudonym "Cardanus," several articles in the "Novosti." He has published in book form "Zhivoye i Mertvoe" (Living and Dead) and "O Fisicheskom Dukhovnom Vospitanii" (On Physical and Intellectual Education). He has translated into Russian Daneman's sketches of the history of natural science, published with supplementary notes in "Mir Bozhi," 1897. At present he is the editor of the department of physics, chemistry, and technology of the "Bolshaya Entziklopedia." Bolshaya Entziklopedia, vii., St. Petersburg, 1902.